This is just one of the gorgeous covers by J.G. Jones and Hi-Fi! Frankenstein’s monster as a superhero? Unlikely as it may seem, Frankenstein is a hero worth emulating in the modern day DC Universe: he’s a defender of humanity, a fearless warrior, and is a gentleman. Despite being a patchwork man made of people’s various body parts, he is a singular character made whole (as well as hilarious and heartfelt) behind the pen of writer Jeff Lemire and artist Alberto Ponticelli in “Frankenstein, Agent of S.H.A.D.E. Volume One: War of the Monsters”. Despite being around the DC Universe since 1948 (and having a memorable reinvention by writer Grant Morrison within the last decade), Frankenstein (also known to his compatriots as Frank or Frankie) has gained a high profile since the DC’s New 52 initiative began in 2011. In this first volume of his own book, Lemire and Ponticelli introduce readers new and old to a character that deserves the spotlight and not the torch. Lemire tosses the reader into the story without explaining every event or science fiction occurrence, which is all for the better. This swashbuckling collection of the first seven issues begins with monsters and ends with monsters. 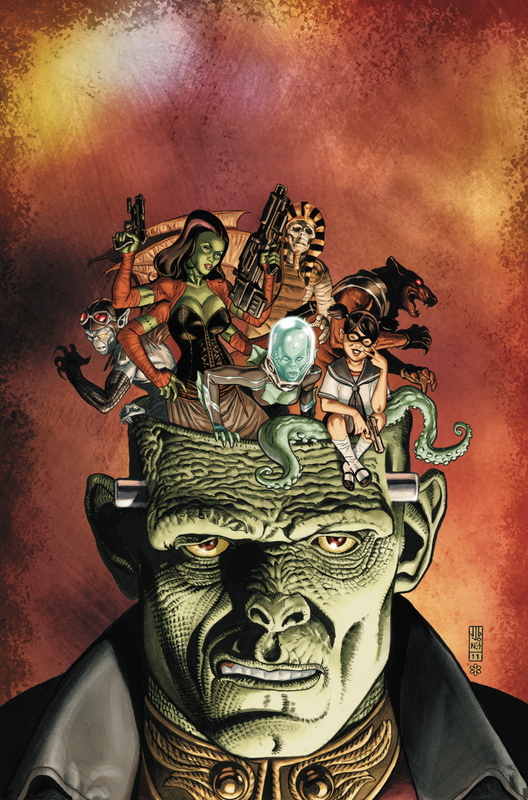 Frankie and his new team, the Creature Commandos (as well as his feisty ex-wife, Lady Frankenstein), are sent on a mission to save a planet in another dimension that threatens Earth. Lemire seems to write this story effortlessly, which proves how much he cares for this character and his world. Breezy is a word to describe the proceedings, with Lemire and Ponticelli naturally utilizing action, humor, and, above all, a sense of wonder and imagination. Lemire is given a sandbox of existing worlds and characters and makes them his own. Language is important to this story, what with fantastical science fiction jargon and equally fantastical characters inhabiting every page. Frank is an agent of S.H.A.D.E., which stands for “Super-Human Advanced Defense Executive”. They deal with the strange and unusual going-on in the world and are just one of the various fun acronyms and ideas that are explained by S.H.A.D.E.NET, which is there to impart information on anything and everything to Frank and the other agents. Snappy and humorous dialogue contributes to the breeziness of this volume, making it feel like a quick read. After Frank dispenses of an old woman and is chastised, he declares nonchalantly, “Frankenstein’s vengeance does not discriminate on the basis of age.” Witty and pithy dialogue and declarations such as this add to the zaniness. Lemire’s creates individual voices for each of the characters, whether big or small, and that comes through in the dialogue. Despite not knowing everyone’s backstory, the reader is left at the end of story feeling as if they have become intimate with them. Imagination and humor is not relegated to words alone. Ponticelli and colorist José Villarrubia bring excitement to the page as well. Splash pages are used liberally and appropriately, what with the various monsters and creatures running around. The first issue has a two page splash scene that demonstrates the unique quality of Ponticelli’s art and also his proficiency with epic battle scenes. 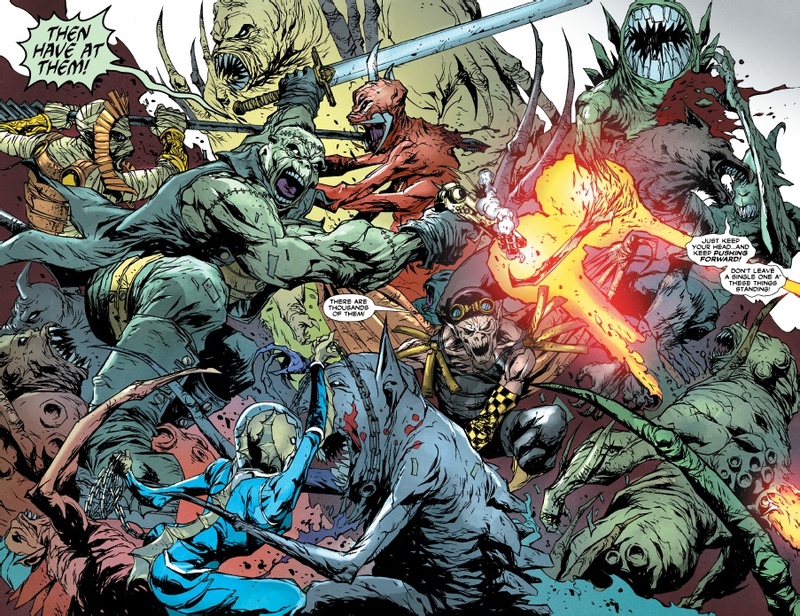 Frank’s mouth is open wide in anger and, along with his Creature Commandos, is depicted as the agent in charge of this mission as they battle horrific monsters. Every Commando has their role in this fight, such as the glorious use of chains by Mermaid against her attacker. The inking and coloring add character, with Frankie’s shading given detail and the yellow and orange of a gun blast popping off the page. Ponticelli and Villarrubia don’t just excel at big action, but also in quieter moments between agents or in scenes such as the one where Agent Nina Mazursky reminisces about the past to her “Personal S.H.A.D.E.NET Journal”. Pathos peppers this brief scene, proving Lemire and Ponticelli can add tragedy among the humor. Mazursky’s path from human to amphibian/human hybrid is told in flashback and the reader gains empathy for a flawed character who was only trying to do the best she could despite her circumstances and what life threw her way. Ponticelli’s art here has more lines within it and, appropriately, seems to evoke a watery feel for a woman who turns into something resembling the creature from the Black Lagoon. The colors are muted in this scene, with brown and pea-green coloring overwhelming the flashback. Art and color fit the scene here and throughout the book, proving writer and artist are simpatico when it comes to the tone of the story. After reading this first volume, the cliffhanger will beg the reader to pick up the second and, sadly, last volume of this series. Despite losing his own title, Frankenstein still lives on in the DC Universe and protects humanity despite not being a human (or at least an alive one) himself. He may not be Superman or Batman, but his credo is one of a true compassionate hero. 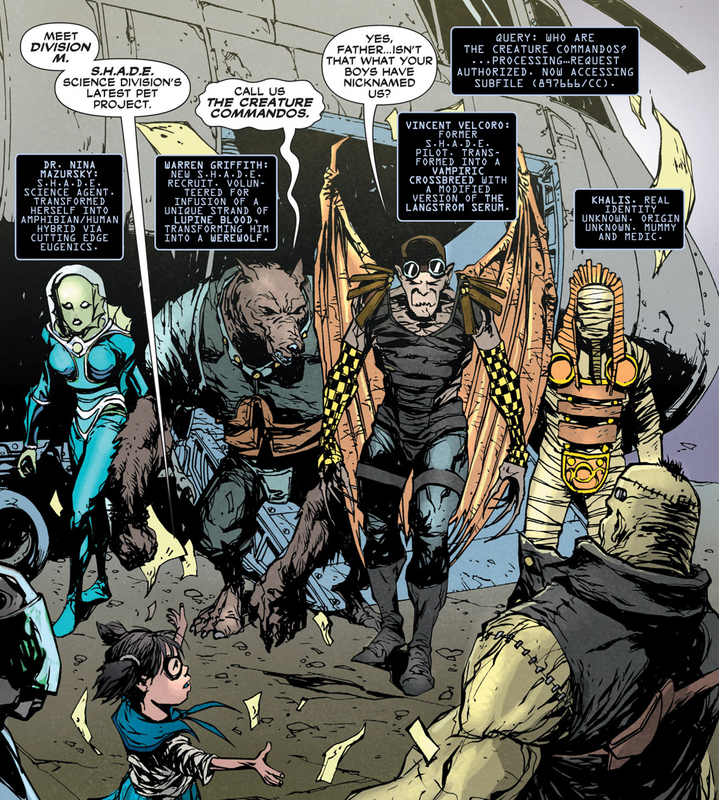 In the fifth issue (co-written by Dan Didio), Frankie states, “My only mission is to protect humanity from the things they themselves cannot bear to face.” Lemire and Ponticelli have most assuredly given Frank many “things” in this book to face that readers definitely would not want to face in their own lives. They have also given the reader a fun time that includes loads of action, a dash of pathos, and a heaping helping of humor.